Hello everyone! Today I’m releasing version 1.5.1 of Patagonia Theme. 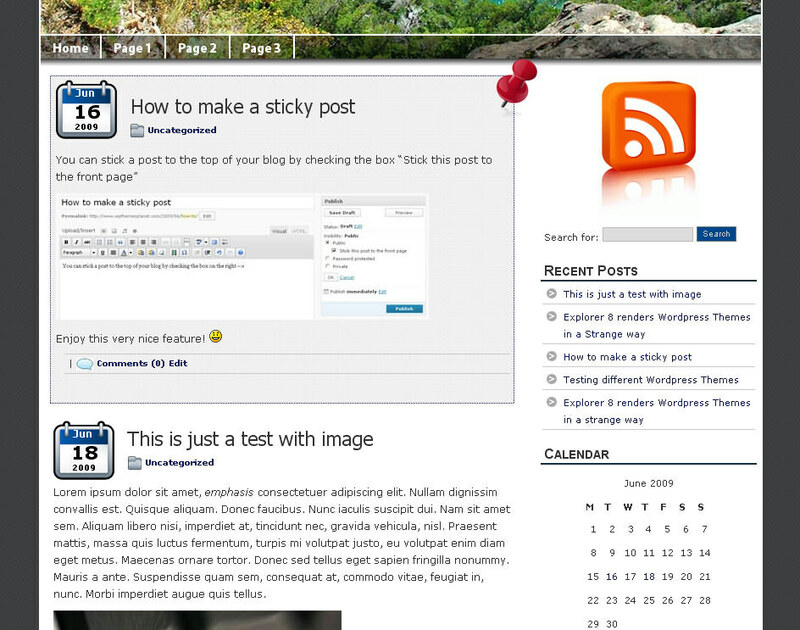 In this version I added the Sticky Post feature among other small fixes. 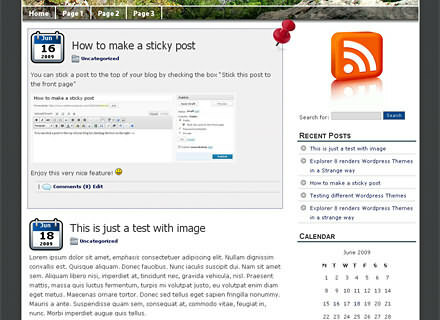 This is a very nice addition that lets you keep a post at the top of your blog. So if you want to pin a specific article at the top of your blog for some time, you can do it now. First you need to select which post you want to “stick”. On the right look for Publish -> Visibility and press edit. Check the option “Stick this post to the front page” and update the post. You can stick as many posts as you want. Cool, I love the look of the sticky post. I have downloaded Patagonia, and I like the look…but I am at a loss to understand how I can modify the template structure (e.g. : adding links under the Header image other than “Home” and “About”. I am a total “newbie” at this. I do know that the php files generate all the HTML content, so I assume that any modification must be done within the php files – but I have not been able to identify any files within the “patagonia” directory that seem to generate that part of the page. I am at a loss! If you would be so kind, please direct a copy of any reply to my email address above. Hello there! To add a page to the link bar you need to go to Pages in your WordPress Dashboard and Add a new page. That page will show up as a new link/page in your linkbar. Any idea as to how I can get it to play nicely? Hi Mike, very nice site. I love your pictures. Please send me the header.php so I can take a look. ooops – didn’t know html would work in comments.. I love your theme and therefore, I will be using it for my blog. But I would love to have the header’s image to be dynamic, that is whenever the user click refresh, the image will randomly change. When do you think you can have that? Hello I will contact you to customize this. I’m interested inthe same customization, i.e. making the header’s image dynamic so it refreshes and changes randomly. Would appreciate receiving the instructions. Hello Hans, I just sent you the instructions to your email. I would like to decrease the left and right margin of the page. Can you please urgent tell me how to do it. If you tell me exactly how to adjust it from the source code, I think I will be able to manage it. You can also email me!! Hello May, I sent you an email. Is it possible to have every page have a different header? I would really like that! Hello Eline, please give more details about this. Do you want to have a different header on every new page you create? Or you want to have a rotator of different header images to show up randomly when your visitors browse throughout your site? Thanks for the fast reply Alex! Eline, I will get back to you ASAP. Hi Dennis, I checked your site on explorer 7. The title isn’t breaking here, however I see the title and tag line displayed on the header-bottom. Do you want to display this on the top? I’m contacting you. Thanks for this wonderful theme, after looking for days this one will work for my needs. I have been trying (unsuccessfully) to set up a ‘child-theme’ of this for all the changes I will be making. Now I can make the changes I want to appear by changing the styles in the parent theme css file, just not in the child theme directory. I really want to use this theme but know i will be making many edits for the project I need to eventually use it for. And i really didn’t want to have to keep track of them all!! Hello Bobbi, I just sent you an email. Thanks for this amazing theme patagonia, It is exactly what I was looking for, However when I go to create a sticky post the option is not there it only says public, private and password protected. I don’ think this is a theme issue because i am running a later version of wordpress that should have this option by default. I am stumped however maybe there isn’t a call to it or somehting any help would be appreciated. LOL this was silly I figured out the above comment and all is well It wasn’t a post I was trying to stick but a page and that isnt possible or needed sorry please delete above comment. No problem! I’m glad you were able to figure this out. DDon’t hesitate to contact me if you need help with something else. I am also interested in having dynamic headers with this theme, would you be kind enough to tell me how. Chris, if you can send me the url of your site to webmaster (-at-) wpthemesplanet (-dot-) com so I can take a look. Greetings, Alex.